Dining in Saratoga during track season can be dangerous. I don’t mean that you risk your life doing it; I mean that there are plenty of places serving mediocre food at premium prices. A perfect example of this type of landmine was Siro’s Trattoria. Mio Posto is a completely different experience. Starting with the fact that they are committed to being open even when the track isn’t operating and following through with the dedication to a fresh and evolving menu, Mio Posto is a special little place that recently popped up in an unassuming location in Saratoga. If you’re walking up Putnam Street from Ben + Jerry’s, you’d totally miss this place, because you’d be distracted by all of the loud and obnoxious outdoor drinking bars filled with bros and hos on Phila street and Caroline street. But if you walk slowly enough and pay attention to the businesses on your right, you’ll see Mio Posto, which is located at 68 Putnam Street. The restaurant inside is very small, and the space and concept for the restaurant hits the Italian osteria (a small place for wine and simple food) perfectly. There may be ten tables inside. Cassie called earlier in the week and made a reservation. I guess everything before 8:30pm was taken, so that’s when our reservation was set for. There was a paper menu handed to us, and there were also some special salads and main dishes on the blackboard in the front of the restaurant. It was very difficult to decide what to order because I would have easily tried anything on the main menu, and the daily specials sounded equally great. 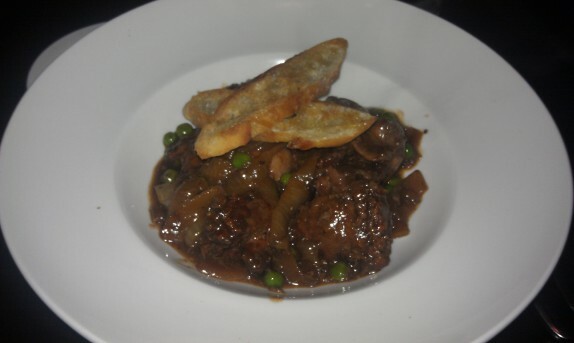 I settled on a starter from the main menu (Crispy chicken livers, peas , onions and demi – $10) and a main dish from the daily specials (roasted lamb sirloin with demi and mint served with polenta laced with marscapone and asiago – $28). 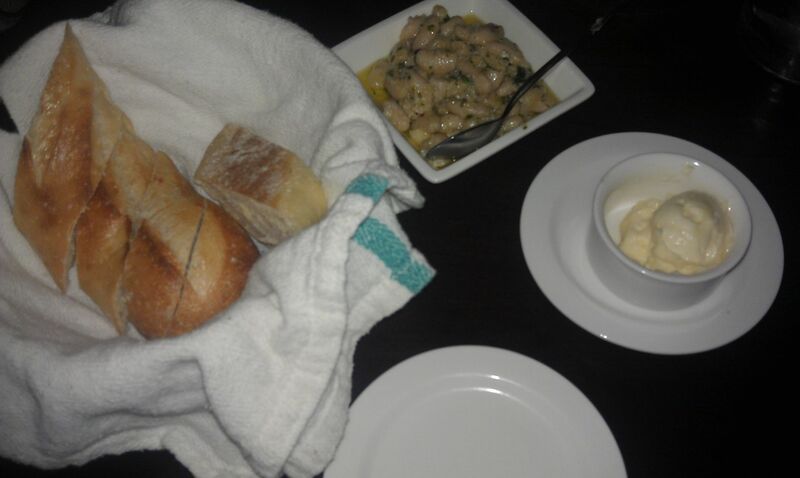 First, our server, Michael, who was extremely friendly and very willing to answer any questions we had regarding the menu, brought us some fresh bread with a cannelini bean spread. I was sitting with my head literally adjacent to their stock of wines, and I had a little fun with one of the bottles. 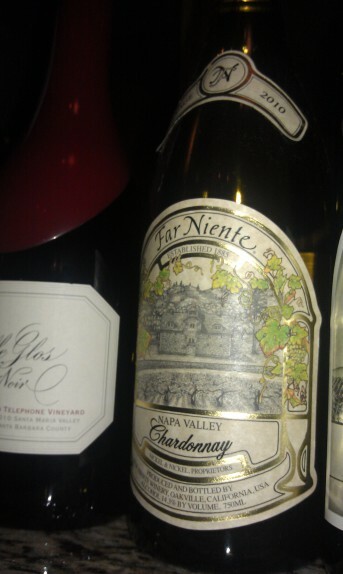 It was a chardonnay called “Far Niente,” which is Italian for “do nothing.” I wouldn’t have expected a wine with this name to have an $85 price tag, but it seems like that’s reasonable from a quick google search. Wow! 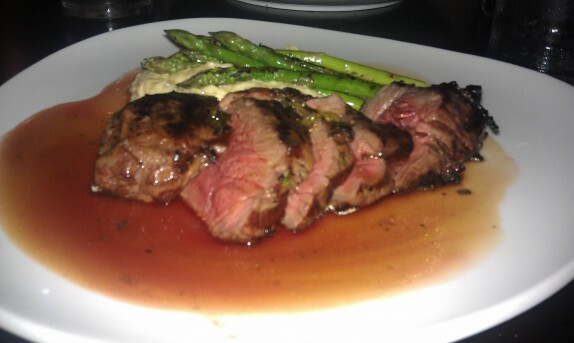 I had a bit of a dialogue with Michael regarding the appetizer I finally settled on. Breaking it down, I saw an issue with it. 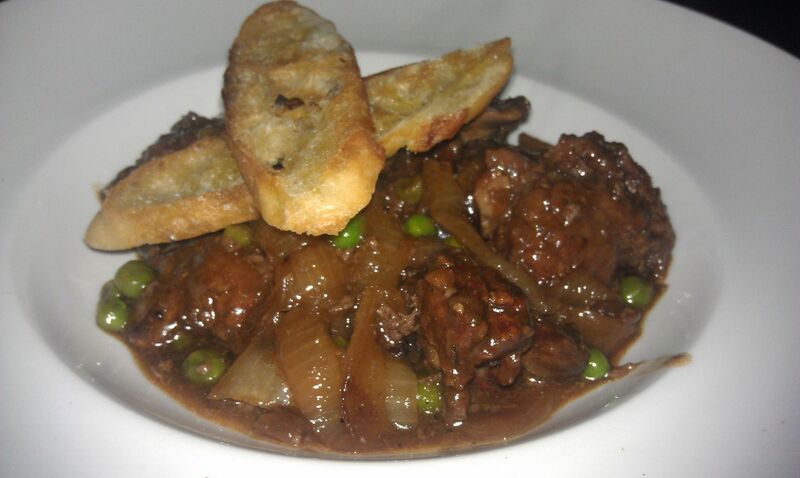 I couldn’t see how crispy chicken livers would stay crispy when tossed in demiglace. He agreed that it was a bit inaccurate the way it was listed on the menu, but I went forward with it anyway. My suspicions were correct, and I had a plate of nicely sauced chicken livers that weren’t at all crispy. The seasoning was lacking, and I had to ask for a salt shaker to correct the seasoning, after doing that, this dish was delicious. The livers were cooked a little far for me, but that’s understandable; many people wouldn’t understand or accept perfectly cooked offal. The peas were nice and fresh and gave a flavor and a texture pop to each bite. This is a dish that is totally meant to be shared. It was rich and very dense; I couldn’t finish the portion. For my main course, Michael explained in detail that the kitchen preferred to serve the lamb medium rare. This wasn’t a point he had to push very hard; that’s how I prefer most meat cooked. Michael left the salt shaker at the table, and the lamb needed to be corrected too. I let him know; he said the guy in the kitchen is usually light-handed on the salt. That’s fine and all, but this dish was so close to perfection that it was a shame I had to add salt. The lamb was tender and delicious. 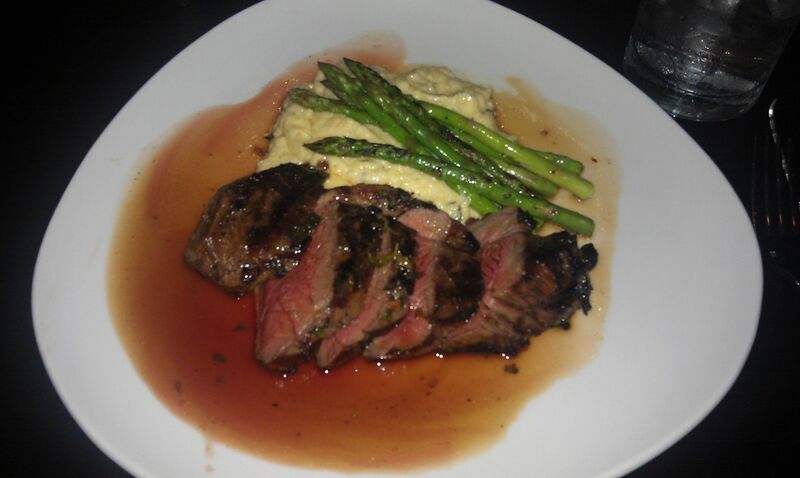 Despite my criticisms on the seasoning thus far, the polenta was perfect, and so were the asparagus spears. 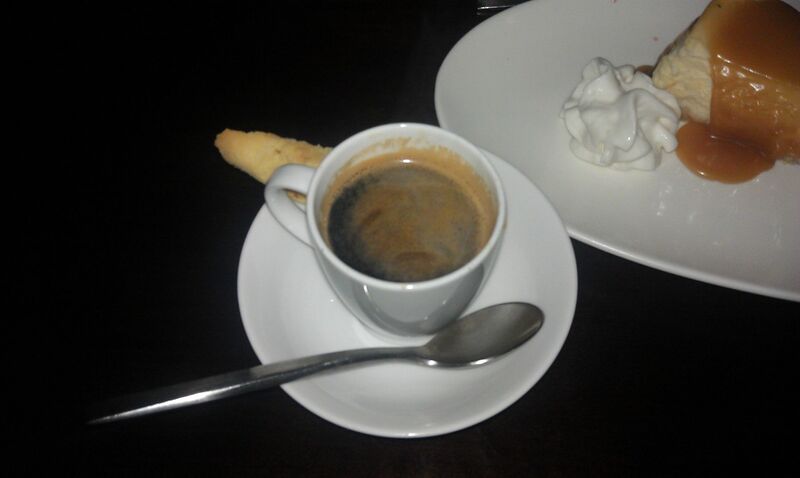 The demi had a very light sweetness in addition to a very deep richness. Everything came together in a phenomenal bite. This is a place that knows how to cook. Period. Dessert was imperative after such a great meal, and, just like I always do, I got mesmerized by buzz words. On the board was a WG Cheesecake ($8). WG stood for Worlds Greatest. 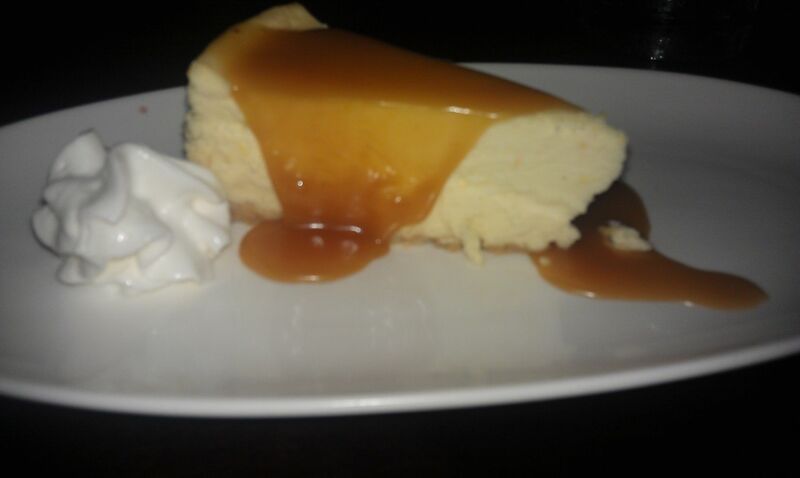 Michael described it as the perfect marriage between an Italian ricotta cheesecake and NY style cheesecake. Forgetting the name, the description sounded special enough. It was really good. Worlds Greatest? Um no. But it was creamy and had a bit of texture but not too much because of the ricotta. What I usually don’t like about ricotta cheesecake is that it’s a bit brittle on the palate. This was great. 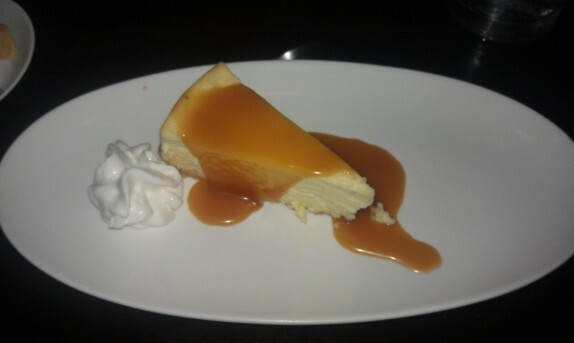 The caramel sauce was also really nice and applied in a good ratio to the cake. Michael also sold me on an espresso. He was very passionate about it. He told me they have a specially made machine that was crafted by some Sicilian guy who lives in Schenectady in his basement. 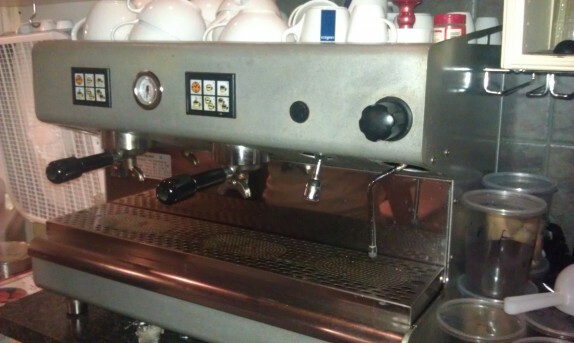 I f*cking love espresso, and I love Sicilian people who make espresso machines in their basements, so I had to have one. The biscotti on the side was a nice touch, and also hits the osteria concept perfectly. Very few places in Italy give you a dried up lemon peel on the side with an espresso. They’ll give you a piece of chocolate or a small biscotti. That’s Italian! The espresso was a little thin. If I had to guess why it wasn’t great, it was most likely because the water was too hot or the coffee was underdosed or it was packed too loosely. It wasn’t bad; I’m just picky with espresso. So I broke Michael’s heart a little by telling him it was mediocre, but I got him to agree to show me the machine this guy made in a basement. It’s a nice rig, definitely not completely a unit you can buy. That’s pretty amazing. I gotta find this basement in Schenectady and talk to this old guy. Alright, back to Mio Posto. So this is a respectable dining option for those of you who are venturing into Saratoga. I would recommend going when it isn’t track season (like now), and I would also recommend making a reservation in advance. This is the type of place that will be full most nights, and that’s something I really like to see. 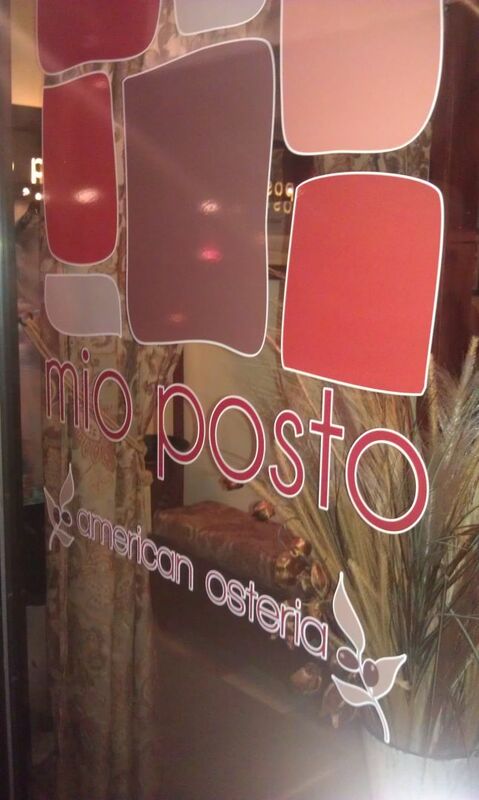 For a place that calls itself an “American Osteria” that opened in 2012, I would say Mio Posto actually perfectly embodies all that an Italian restaurant should be. It’s not about flopping marinara sauce, capers, butter, or lemon all over everything. It’s about fresh ingredients, simple preparations, and a cozy atmosphere where you can enjoy everything. We had a marscarpone pineapple cake for dessert and as weird as it sounded, it was incredible. I don’t praise desserts lightly, most restaurant desserts leave me cold. That’s crazy about the pasta portion sizes. 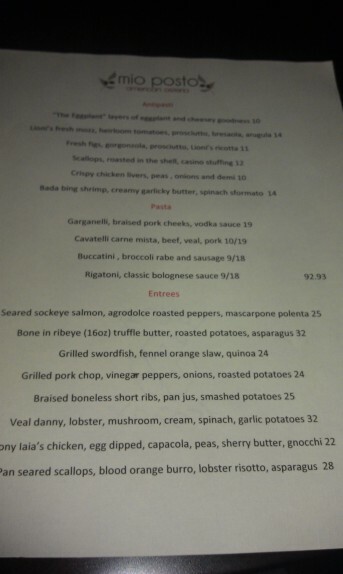 Good to know you could split an app, get a small pasta and still walk out of there with a doggie bag. That’s nucking futs. In other news, I actually have a story to share about Far Niente.